We have a few years of experience in the construction and the management of trampoline parks. Our experience allows to provide comprehensive business knowledge in this particular field. Our company is constantly monitoring the market trends and the newest technological solutions. trampoline park, ninja park, climbing walls, parkour zones and centers of electronic entertainment. A comprehensive offer allows us to offer excellent quality at the best prices. Safety of the clients and theirs satisfaction are our company's mission. A few years of experience allows us to provide our clients with the best materials and finish. Our structures are made throughout the country which provides our clients with long-term service. Projects are tailored to the individual needs of each location. Our company provides comprehensive solutions for trampoline parks, including the equipment of the reception, cafes, and locker room. The idea for Trampoline Park is tailored to the individual needs of our clients. This applies to the selection of individual attractions as well as the division of the park space into the appropriate zones. We make an individual project choosing the appropriate form, marketing decorations and colors in such a way as to give your premises a special and unique character. We offer warranty and post – warranty service (from 12 months to 5 years). We manufacture all the structures of our parks in Poland. What conditions must your trampoline park room fulfil? The minimum size of the room depends on the location and it ranges from 450 m2 to even 3500 m2 to provide great fun for clients and financial return for the investor. The minimum height of the room is 5.5 meters (18,4 ft.) from the floor to the first structure. The optimal height of the hall is 7 meters (22,97 ft.). What is the cost of building a park? How long does the start-up last? From the formal approval of the final version of the project (CONTRACT), the construction takes about 3 months. We make everything in our own production halls, therefore it is possible to make a construction with a delayed assembly in the customer's premises. Then our team install the devices in the hall, it usually lasts about 20 days, with smaller spaces shorter. How to start cooperation with JumpWorld? The best way to start cooperation is a meeting where we will present our capabilities and materials on which ones we work. It is necessary to prepare dimensioned plans of the building to create 2D layout based on your suggestions or using your own experience. 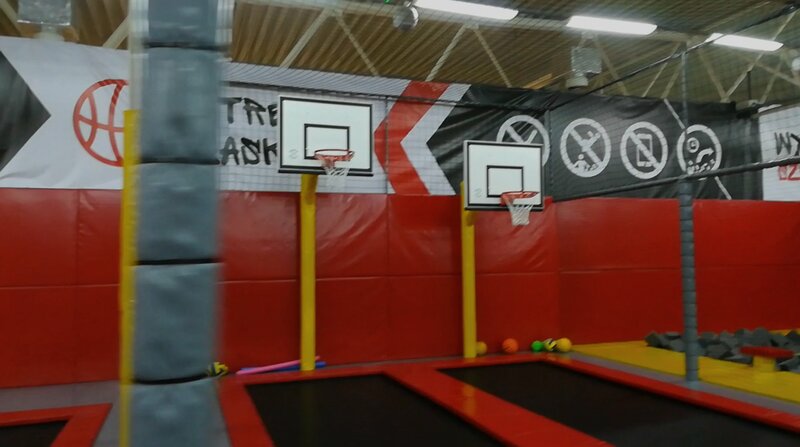 Jump World has existed for several years. We are the owner of trampoline parks and producer of recreational equipment. Several years of experience in the construction of park structures is the best guarantee of quality, warranty service and safety. The warranty of products included in the trampoline parks covers the period from 12 months to 5 years depending on the item. Why is JumpWorld the best choice for cooperation in the construction of trampoline parks? JumpWorld has several years of experience in the construction and running of its own trampoline parks, which allows us to provide comprehensive knowledge to our clients. All devices have safety certificates valid in Europe approved by independent experts.